Covers the Burgundy Wine Regions. Partie Meridionale du Gouvernement Genl. de Bourgogne ou se trouvent les Bailliages d'Autun, et de Challon, le Maconois, la Bresse et le Bugey divises en leurs Mandemens. Gouvernement General du Lyonois divise en Lyonois, Forez et Beaujolois. 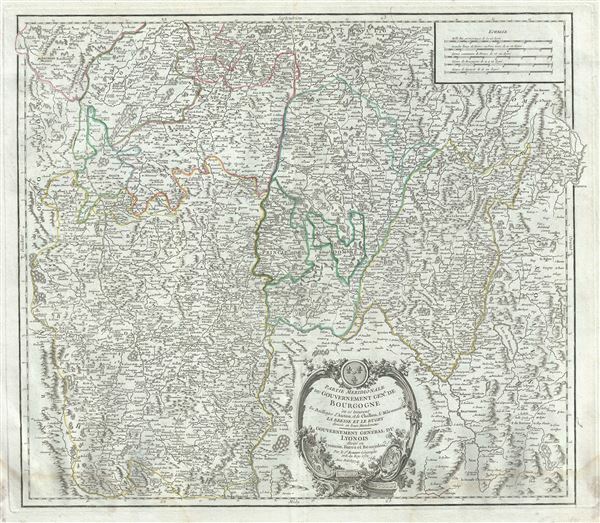 This is a beautiful 1752 map of the southern Burgundy (Bourgogne) region of France by Robert de Vaugondy. It covers part of the Burgundy and Rhone-Alpes regions of France including the whole or parts of the modern day departments of Saone-et-Loire, Ain, Rhone and Loire. The map extends from Bourbon-Lancy in the west to Geneva, Switzerland in the east and Monistrol-sur-Loire in the south. The map rendered the entire region in extraordinary detail showing roads, canals, rivers, cities, villages, chateaux, etc. The region of Burgundy is famed for producing the world's finest wines. It produces what are arguably the world's finest, and most expensive Pinot noir and Chardonnay wines. The Saone-et-Loire department produces Mercurey and Givry among other red wines. Around Macon are whites of fine quality, notably Rully, Montagny, and also Pouilly-Fuisse, a dry, heady wine with much bouquet. Ain, part of the Rhone-Alpes regions, is known for its Bugey wines, which are generally aromatic and white. It is also known for its fine blue cheese, poultry, and fisheries. Rhone produces the French AOC wine, Beaujolais. This wine is generally made of the Gamay grape which has a thin skin and is low in tannins. It is typically a light-bodied red wine. A beautifully engraved title cartouche adorns the bottom left quadrant of the map. Drawn by Robert de Vaugondy in 1752 and published in the 1757 issue of his Atlas Universal. The Atlas Universal was one of the first atlases based upon actual surveys. Therefore, this map is highly accurate (for the period) and has most contemporary town names correct, though historic names are, in many cases, incorrect or omitted. Very good. Some wear and toning along original centerfold. Original platemark visible. Minor spotting and offsetting. Rumsey 3353.038. Pedley, Mary Sponberg Belle et Utile: The Work of the Robert de Vaugondy Family of Mapmakers, 143.